For Memorial Day weekend, our motley crew of city-folk adventured out the mountains of West Virginia for some fresh air and grilling. 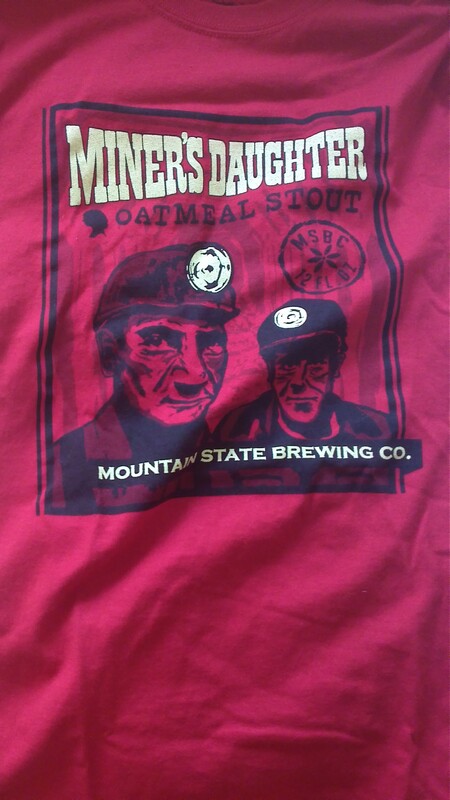 My one request was that we stop by the Mountain State Brewing Company, a local brewery. 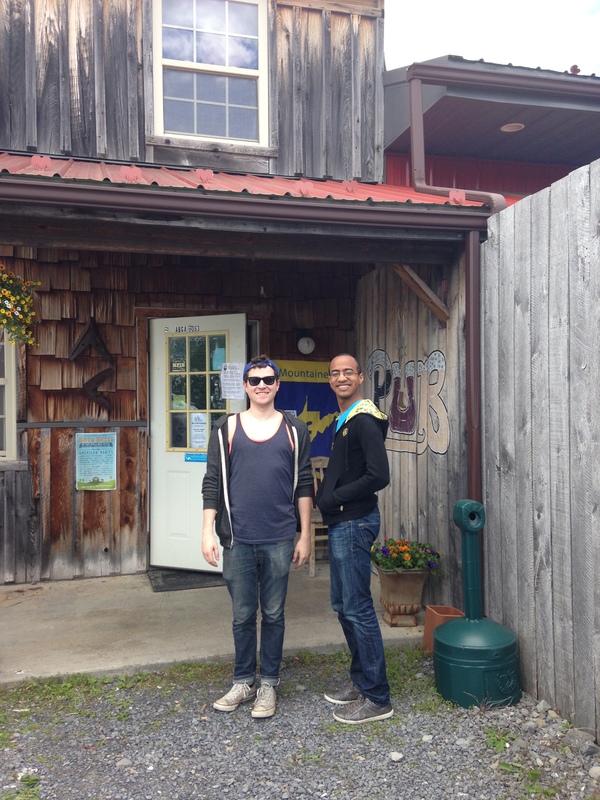 Above are Stephen and Gabe in front of the brewery’s pub. 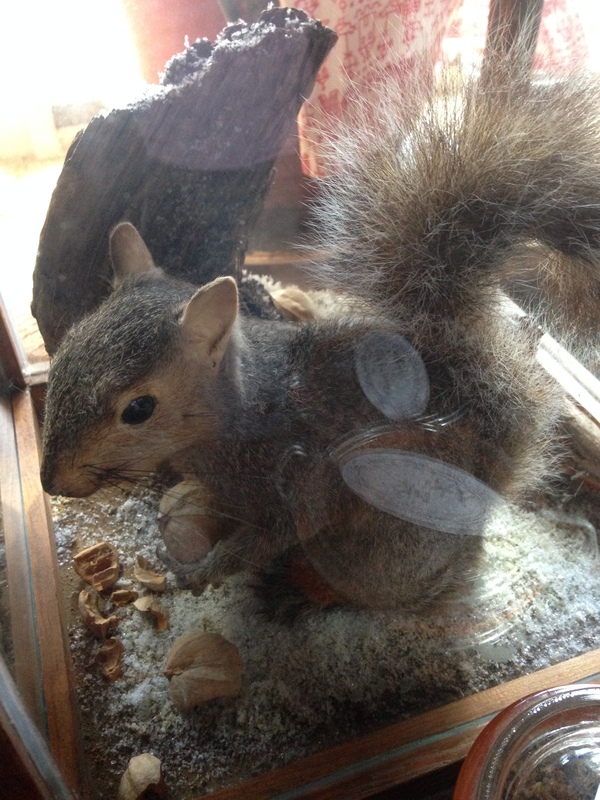 Inside, it had a very wooden-rustic look that felt very down-home, but not in a kitschy or fake way. At three in the afternoon, there weren’t many patrons, but the bartender was happy to help us out. They were also serving some really great looking sandwiches. So, the beer! First of all, the prices were great (although after being in New York long enough, just about any price for beer seems reasonable). 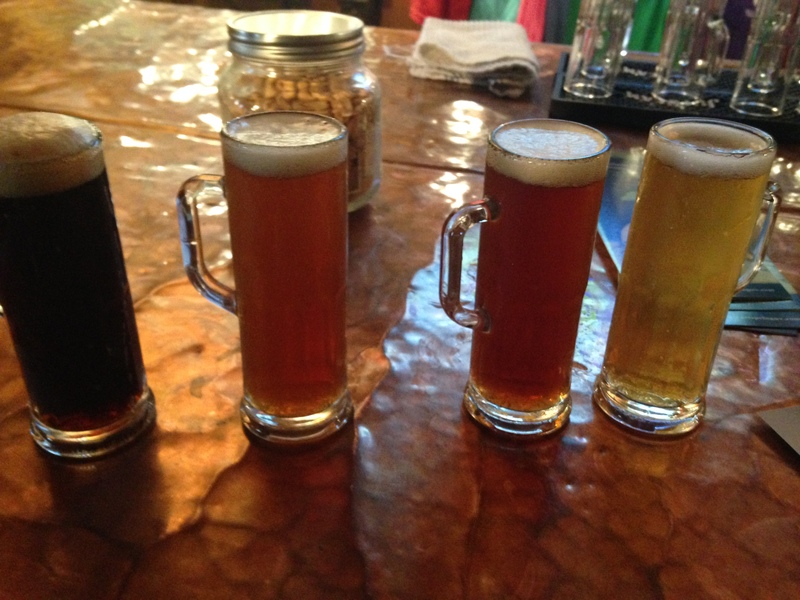 The sample flight included their four main beers. From left to right are the darkest to the lightest. First is the Miner’s Daughter, an oatmeal stout. It wasn’t as heavy as other stouts I have tried, but still too dark for my taste. Next is the Seneca India Pale Ale (my second favorite), which had the great hoppy taste without the bitter aftertaste that many IPAs have. Third from the left is the Almost Heaven (are you sensing a West Virginia theme here yet?) Amber. This one was nice, lightly hopped with a caramel aftertaste. My favorite was the final, the Cold Trail Ale, a light but not too wheaty Blonde Ale. Our group took a six pack of the IPA and Blonde to enjoy by the lake later in the weekend. I found this little guy near the bar. Maybe it was a tiny bit kitschy, but that’s okay with me. I had to get a souvenir t-shirt! Even though it wasn’t my favorite beer, I did really love the design for this one. In addition to great beer, Mountain State does have excellent design for their packaging. They also have other brewery locations in the WV/PA area, but if you find yourself in a specialty beer store that carries Mountain State, I would highly recommend giving it a try. Next Post Dessert in a Jar?